Roberto Lázaro Arroyo is the happy owner of a herd with 60 cows. 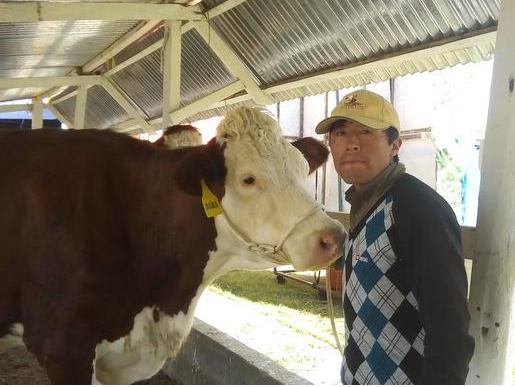 He's working with the Montbeliarde breed in Chile. He appreciates the productive life and the quality of the montbeliarde milk. With Brow Swiss, they have 8 to 10 years of milk production. Compared to Brown Swiss and its 8 to 10 years of milk production, the Montbeliarde can produce from 17 to 20 years with a good milk quality. For the students of National University of the Center of Peru (UNCP), the sales of milk go from bad to worse. To feed the cattle is very much bigger than the income that generates the sale of milk. Thanks to his profitable Montbeliardes, Roberto earns a few cents more than the other breeders.